The Legend of Zelda: Breath of the Wild is a weird addition to the Zelda narrative for plenty of reasons, one of the main ones being the absence of so much of iconic Zelda imagery – and it’s all by design. Yep, it’s true – you can have a Zelda title without Link being clad in the green tunic all game, with the only tunics available in the game amiibo bonuses or late game unlocks. It works fine without it. The same is true of the Master Sword, which only shows up in Breath of the Wild as an optional bonus – you can finish the game quite happily without it. As noted earlier you can head into Hyrule Castle at any time from the moment you escape the Great Plateau in the game’s opening – and the Hylian Shield can be found within. 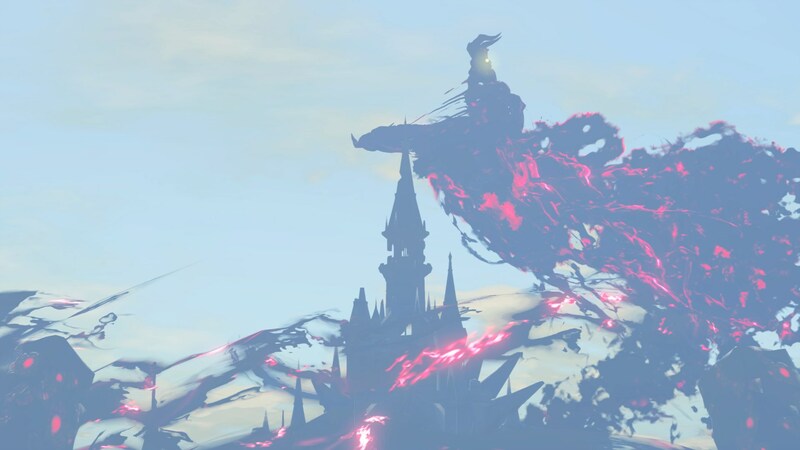 Just be aware that the castle is essentially the game’s final area, and so it contains some pretty powerful enemies. The shield is found within an area of Hyrule Castle known as the Lockup – it’s in the basement on the West side of the castle. You’re best off approaching from the rear of the castle – so to begin with loop around the castle (the Woodland tower is pretty close) to the rear side. If you look at the castle, five bridges extend out from the land across the moat towards the castle. Most of these bridges are broken, but they would’ve formed a sort of star shape before Ganon struck. You need to stand at the back of the castle near the top of the star shape, or the single bridge in the middle of the top of the castle. Once near this bridge, you need to head to the right of it when facing the castle – this will take you West on the map of Hyrule. Look out for an area you can glide to on the castle grounds – a ramp that is low and close to the moat. You might be able to make out some blue-glowing luminous stones in the distance. Jump and glide over there. This is where the lockup is. Head up the ramp, run past the guardian and head into the lockup. Once you get into Hyrule Castle you should be on alert – this is a very late-game area, after all. Our aim is to get in, get the gear, and get out. Through the door you’ll encounter a locked metal gate; lift it either with Cryonis on the puddle or with Magnesis and walk through. In this area there are enemies in cells, and you can let them out with the switches in the middle of the room. The cells contain some good high-end stuff, so if you want to head inside and take the enemies out do so, but be careful. At the end of the lockup (which is a long corridor) you’ll find a side room on the right. There’s some bones in here… walk in the room and the gate will slam behind you and you’ll have a battle against a Stalnox. This guy actually isn’t that hard – all you need to do is aim for his eye with a single arrow. Hit him there, then when he falls over go in hard with melee weapons. When he stands up, repeat the process. At the end of the fight his eye will fall out – smash the eye to pieces to finish it. If you have the upgraded version of the Stasis Rune that can freeze enemies in place, use that to make hitting the Stalnox eye even easier. This fight is doable – it’s downright easy with better gear, but even if you’re weaker you can do it if you’re careful. At the end of the fight his eye will drop out – finish it off quick before his body scoops it back up. Once the Stalnox is dead, the Hylian Shield will drop. It’s a good shield – it has the highest durability and parry ability in the game. It’s also a one-time deal – you can’t get it in this method again, and this is the only place in the game it appears naturally. 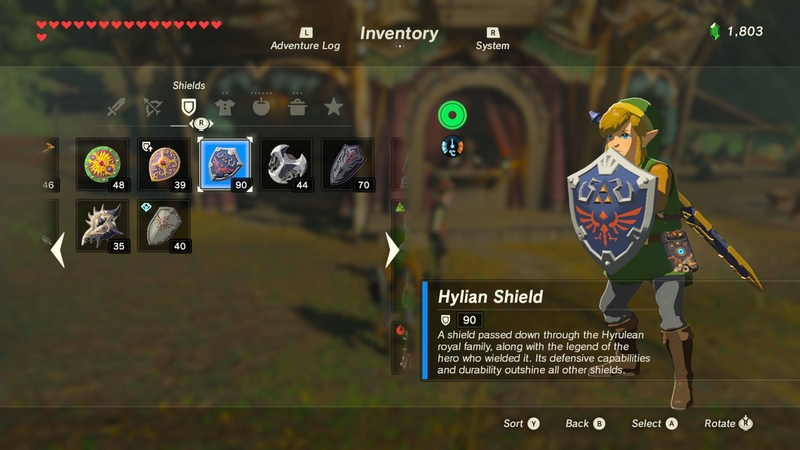 If you lose your Hylian Shield, a character in Tarrey Town will sell you another version of the shield – but it will only be available to you if you’ve already picked up the shield from Hyrule Castle and broken it. Rumor and speculation suggested you could also get the shield via amiibo – but take this as confirmation, you can’t. This is detailed in our guide to the game’s amiibo; the official Breath of the Wild amiibo drop chests containing shields and other items when scanned – but the Hylian Shield isn’t one of them.